A popular Hindu festival, Vasant Panchami is celebrated on the fifth day of the month of Vasant according to Hindu calender. This year, it will be celebrated on Sunday, 10 February. Vasant Panchami celebrates the onset of spring season and the day of the birth of Saraswati, the Goddess of ‘Knowledge and Learning’. This festival symbolises prosperity, light, energy and optimism. So, people not only wear yellow clothes but also make traditional delicacies in yellow hues on this day. ‘Kesar sooji halwa’ is one of the revered sweet of this festival that is offered to Goddess Saraswati. 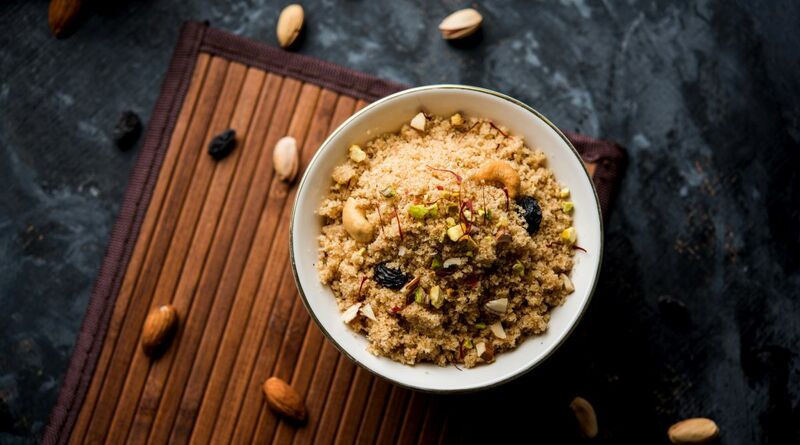 The popular dessert is made of semolina (sooji), pure ghee, sugar, nuts, raisins and saffron (kesar). The soft texture of this halwa just melts in the mouth and once tasted, you crave for more ‘n’ more to eat. Prepare this simple and very delicious sweet dish and serve as naivedyam to Goddess Saraswati on this special day. Heat ghee in a thick bottomed pan. Add chopped almonds, cashew and pistachios and fry till light golden for a minute on low flame. Add raisins also and cook till they are swollen in hot ghee. Take them out and keep aside. In the same ghee, pour sooji and roast it on low flame for 30 minutes stirring it consistently. In the meantime, soak saffron strands in two tablespoons of warm water. Also, add two cups of water in two cups of milk in a separate container and keep this mixture to boil on high flame adding sugar to it. Stir occasionally to mix sugar well and let it dissolve in this mixture properly while kept on flame. When sugar gets completely dissolved in milk-water mixture, turn off flame and keep aside. After half an hour of stirring on low flame, sooji will start leaving a soothing aroma. It will slightly change its colour and become crunchy. You do not have to roast it till it changes brown in colour. You only need to cook it in ghee to make little crunchy and aromatic. Now add milk-water-sugar mixture in it stirring it constantly, otherwise lumps will form. Add saffron dissolved in water, cardamom powder and fried nuts and raisins to it. Transfer it in a serving bowl. Top it with few more dry fruits like chopped almonds, cashew nuts and pistachios to give a nice crunchy effect. Note: Do not compromise while pouring ghee. This quantity of ghee is a must for perfect consistency and taste. Kesar will give the aromatic yellow hue making it more tempting to eat especially on this day.